We are excited to be doing a series of trainings for State of Oregon HPCDP grantees at county health departments. This series of trainings entitled Agents of Change is aimed at helping participants with the process of health policy change at the local level. This will be a four part series as listed below. We can't wait to get started. These trainings are always very interactive and cater to a wide variety of experience levels. Stephanie has experience working with the University of Oregon's tobacco free policy passage and implementation as well as providing technical assistance for the passage of the policy for the University of Alaska, Anchorage. Coca Cola has an interesting take, heading the the calorie counts of their beverages head on. How do you feel about this? Do they still make burning calories look too fun? 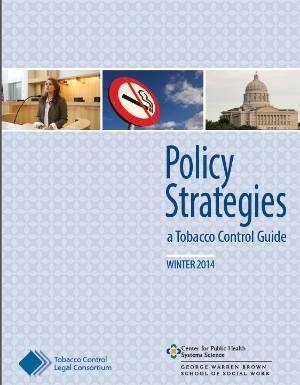 A new guide for Policy Strategies in Tobacco. Our CEO Jill Thompson (Hutson) provided input to this work. Check it out. One of our favorite projects each year is hosting the two day Western States Policy Directors Meeting. The Rede Group has been hosting this meeting in Portland for four years now. This year we held the event at the Leftbank Annex next to our office in the Rose Quarter. We were extremely lucky to have the Tobacco Control Legal Consortium through a CDC grant sponsor the event this year. We had folks from 10 different states joining us including Alaska, Arizona, California, Colorado, Hawaii, Montana, Minnesota, Oregon, Washington and Wyoming. It was a fantastic meeting with a level of expertise that we rarely see in one meeting. With all of these great folks working on tobacco control our states are in dependable hands! We are really looking forward to doing this again in 2014! The Rede Group will go to the ends of the earth for our clients. This week our work took us to the northernmost town in North America (Barrow) on the Arctic Ocean. We wanted to hear what folks at the top of the world felt about sugary beverages and their kids. What sort of beverages would you drink when milk is $14 per gallon? We wanted to know. If you want to know too, you will need to read our report! Robb in Barrow, Alaska overlooking the Arctic Ocean. With the health of our employees in mind the Rede Group is beginning our first annual summer challenge! In our city, not far from our offices is one of the largest city parks in the world. Portland's Forest Park has 81.3 miles of hiking trails. Our goal is to hike every inch of those trails this summer. It is our challenge. At the end of the summer the employee who logs the most miles will get a prize and we will celebrate with a barbecue at the CEO's house. We may even take a few trips out during work hours to stretch our legs. We are excited about this challenge and will be posting photos of our time on the trails to our Facebook page. We are all excited to conquer Forest Park! Rede Group in a "Cool Space"
The Rede Group was recently featured in the Portland Business Journal's "Cool Spaces" series. In the article they feature our unique features for being such a small firm. We are excited to promote our space and emphasize a culture of wellness here. We have provided stand-up, moveable desks, bicycle parking, streetcar access, a locker room and shower and policies that promote health! Please check out the article here! If you have followed the Rede Group and what we do, you probably know that we are into research. We love doing studies, gaging opinions, and generally digging deep into things. As you may also know, our firm has deep roots in both Oregon and Alaska. We spend time working, researching and training all around both of these great states. With that we are very excited to be starting up on two interesting research projects! We are beginning a Tri-County (Deschutes, Crook and Jefferson) project in Oregon. It is shaping up to be an exciting research project. We will be looking at retail environments, surveying shop owners and doing a few focus groups. Lots of great work. In Alaska we are beginning a focus group project with Alaska's Play Every Day project. We are looking at the beliefs and attitudes among parents who serve their children sugar sweetened beverages on a regular basis. This project will take us on a whirlwind tour around Alaska in June. Check out the campaign at: http://dhss.alaska.gov/dph/PlayEveryDay/Pages/default.aspx. A poster from Alaska's Play Every Day campaign. Jill and Robb just spent a fabulous week in Anchorage for the Alaska Tobacco Prevention and Control Program's Spring Grantee Training. The weather was amazing (sunny and cold!) and the participants were great. Between Robb and Jill they led or helped facilitate four different sessions. The sessions ranged from the importance of good policy in public health to creating local tobacco taxes. We are really looking forward to our May trip to Kodiak for this year's Alaska Tobacco Control Alliance Summit!